This 1/2 carat engraved heart wedding bridal ring set in 14K yellow gold is a warmly-shining symbol of your affection as it uses a timeless symbol to celebrate your love. A pattern of hearts adorns the outer surfaces of both the engagement ring and the wedding band, framed by milgrain edges and pointing the way to a dazzling diamond. This half carat round stone is held securely to the engagement ring by a four-prong setting as it rises above this 14K yellow gold pair. 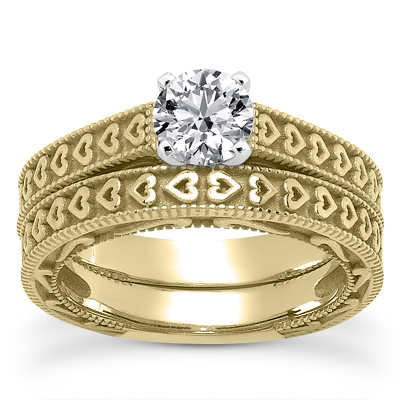 A 0.50 carat diamond is set in an engraved heart bridal ring set in 14K yellow gold. Apples of Gold Jewelry guarantees the 1/2 Carat Engraved Heart Wedding Bridal Ring Set in 14K Yellow Gold to be of high quality and an authentic engagement ring with real diamonds, as described above.